Hint: You can do it outside. These healthy recipes are all created to pair with wine (which has 120 to 150 calories for a 5-ounce glass)—all for 600 calories or fewer. I was craving roast chicken recently but I didn’t want to turn on the oven. I’m also not lucky enough to have a rotisserie place nearby. My solution: Grill a (half) bird in a roasting pan. 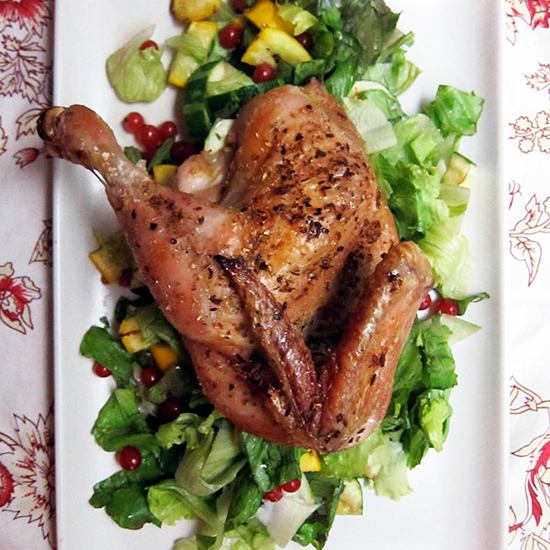 Inspired by the Zuni Café’s legendary roast chicken, I served my chicken over a simple salad and used the juices that collected in the pan to dress it. Instead of adding dried currants (which are actually more like small raisins), I opted for the puckery, jewel-like fresh ones I found at the farmers’ market. Because grill temperatures vary even more than oven temperatures, the timing here is approximate. Your ultimate goal is to get a bird that’s nicely browned on the outside and cooked through. You may need to adjust the heat on the grill if the bird is browning too quickly or not quite fast enough. To pair, try a sparkling red wine that you serve chilled. 1. Light a grill, arranging it so half or two-thirds of the grill is set to high and the other part is set to low. In a mortar (or small heavy bowl), combine the fennel with the coriander, crushed red pepper and 1 teaspoon of kosher salt. Use a pestle (or the bottom of an ice cream scoop) to pound the mixture until the seeds are broken. 2. Rub the chicken all over with 1 tablespoon of the olive oil and then season well with the spiced salt. Arrange the chicken in a disposable aluminum pan or a heatproof roasting pan and set the pan on the cooler side of the grill. Grill for about 10 minutes, keeping the lid closed as much as possible, until the chicken skin is golden. 3. Meanwhile, brush the summer squash with the remaining 1 tablespoon of olive oil and season with salt and pepper. Grill over high heat, turning once, until tender and lightly charred, about 2 minutes per side. Transfer the squash to a work surface, let cool slightly then slice crosswise 1 inch thick. 4. Reduce the heat on the hot side to moderate or moderately low and continue to cook the chicken for about 20 minutes longer, until the chicken is browned and a thermometer inserted into the inner thigh registers 165°. Transfer the chicken to a board and let rest for about 10 minutes. Pour any juices from the pan into a large bowl. 5. Add the squash, lettuce, currants and vinegar to the bowl and toss. Season the salad with salt and spread it out on a platter. Top it with the chicken and serve, carving it at the table. One serving 454 cal, 32 gm fat, 1.8 gm sat fat, 8 gm carb, 3 gm fiber, 43 gm protein. Wine Berry rich, dry Lambrusco, such as NV Cleto Chiarli Pruno Nero.